Nine Standards Rigg is a fell in the nort-east of the Dales, which is named after the set of prominent cairns that are situated to the north of the summit. 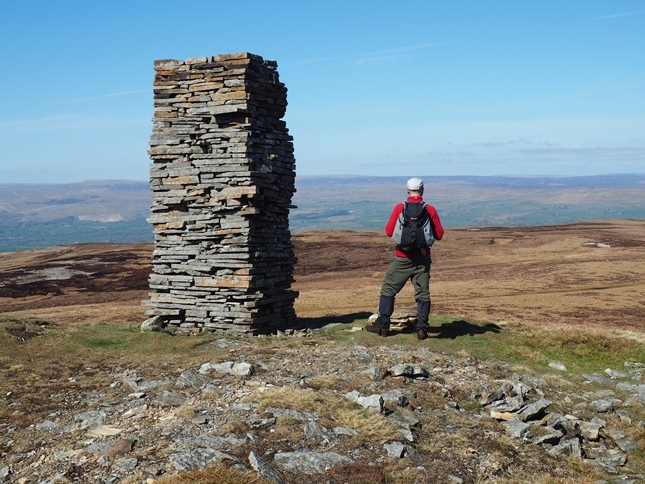 Nine Standards Rigg is the highest point of a vast and unshapely sweep of moorland that sits between the gathering grounds of the River Swale to the south and east, the River Belah to the north and the Eden valley to the west. 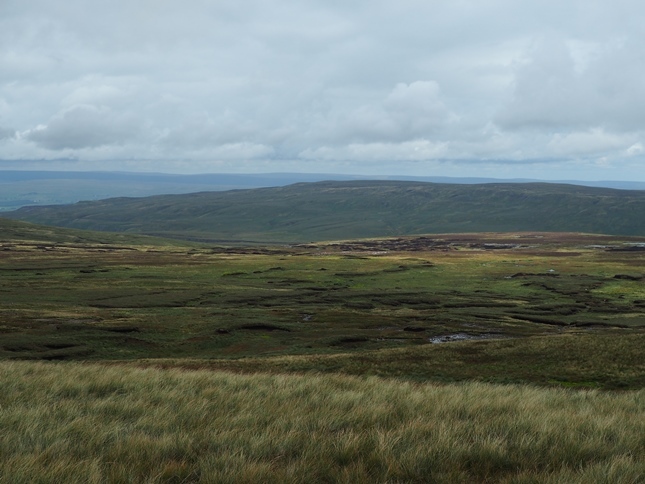 Whilst a portion of the fell lies within the Yorkshire Dales National Park the summit itself was excluded, presumably because at the time it was beyond the county boundary and was thus in Westmorland. Today the summit is in modern day Cumbria. 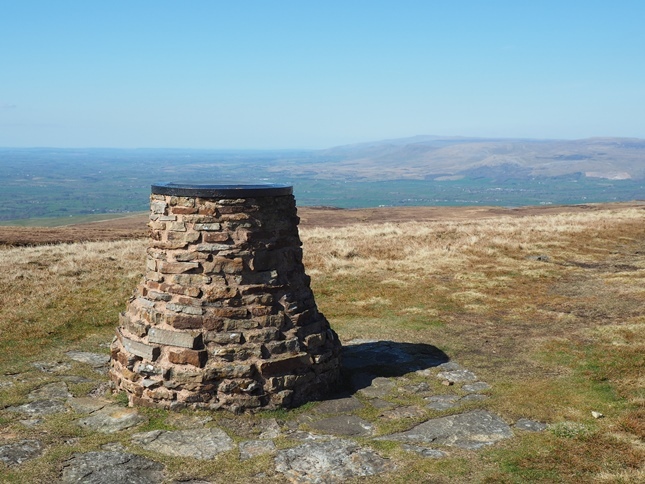 Whilst a recent expansion has seen a whole area between Kirkby Stephen and Appleby-in-Westmorland incorporated in to the Yorkshire Dales National Park, Nine Standards Rigg lies inside the North Pennines Area of Outstanding Natural Beauty. Without doubt the most interesting feature of the fell, and hence its name, are the Nine Standards that lie to the north of the summit. 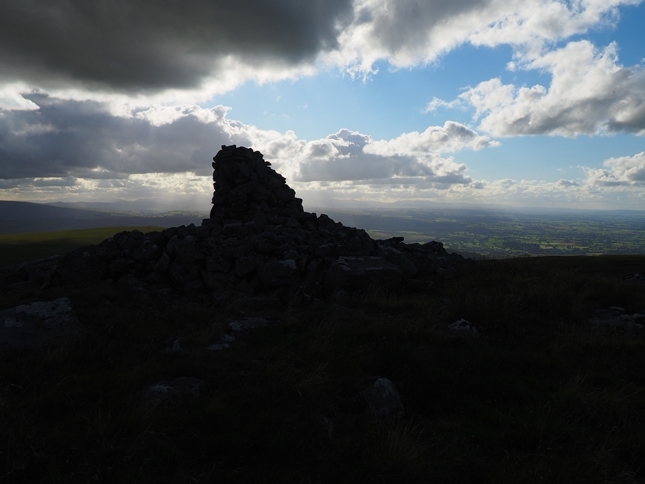 Prominently sited and a landmark for miles around in the Eden valley the Nine Standards are a collection of large cairns built to a number of different designs. Once thought to be of early-modern origin a local project that ended in 2014 came to the conclusion that cairns have stood on the site for at least 800 years. 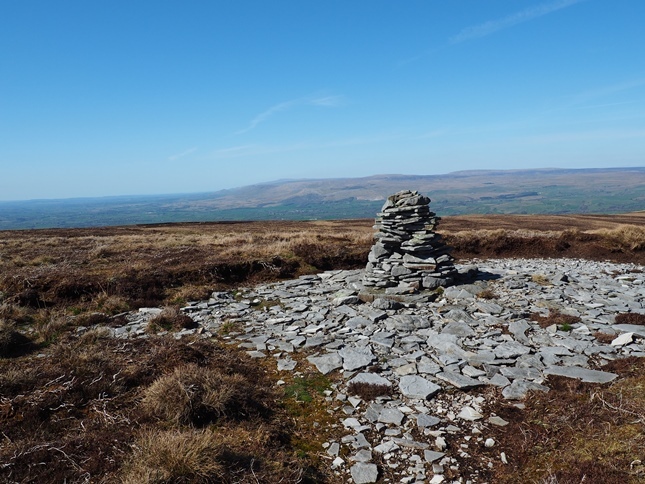 Today’s cairns are not the originals and have been rebuilt a number of times, most recently in 2005 when several of the cairns were in a poor state. 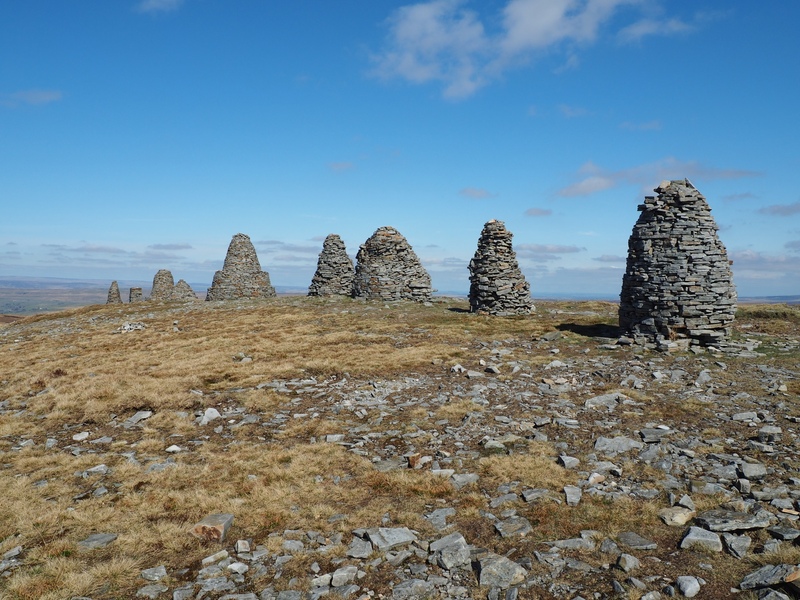 Whilst the name ‘Nine Standards’ has been around for a couple of hundred years there is evidence that there may at one time have been as many as 13 cairns. More information about the findings from the research can be found on the Nine Standards Project website. The Nine Standards were no doubt in Wainwright’s mind when he designed his now popular Coast to Coast walk. 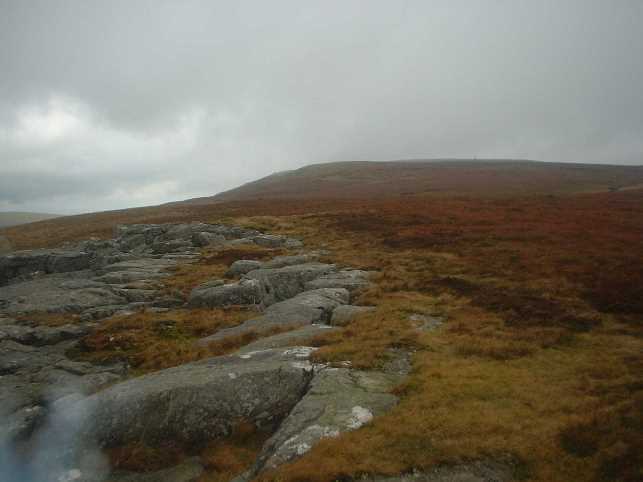 The route of the Coast to Coast passes the Nine Standards and over the summit. 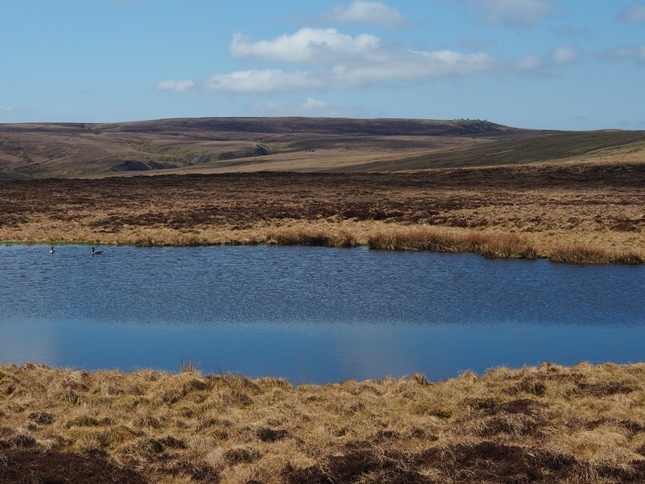 However, due to the nature of the large peaty plateau, erosion has been a problem in recent times. As a result routes off the fell for Coast to Coast walkers vary depending on the time of the year. To the south of the summit a new signpost has recently been erected and flags laid showing the route variations depending on the time of year. 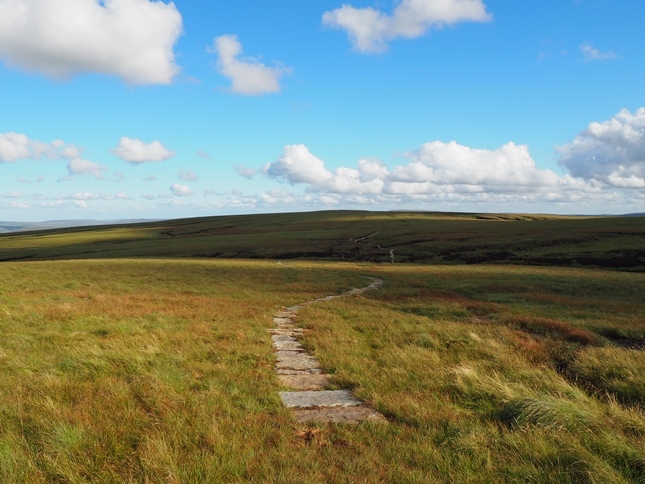 Probably the most popular route on to Nine Standards Rigg, and the one traditionally used by Coast to Coast walkers, is via the road leading up past Hartley Quarries and on to the path climbing alongside Faraday Gill. There is a fine moment on this path when the Nine Standards come into view framed by twin cairns either side of the path. An alternative start that begins at a higher elevation is from Lamps Moss at the summit of the B6270 between Nateby and Keld. 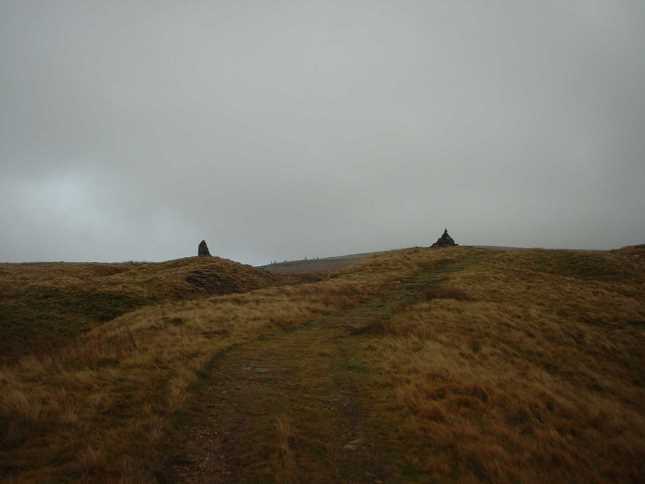 A path links up with the Faraday Gill route or alternatively heads more directly for the summit via Rollinson Gill. 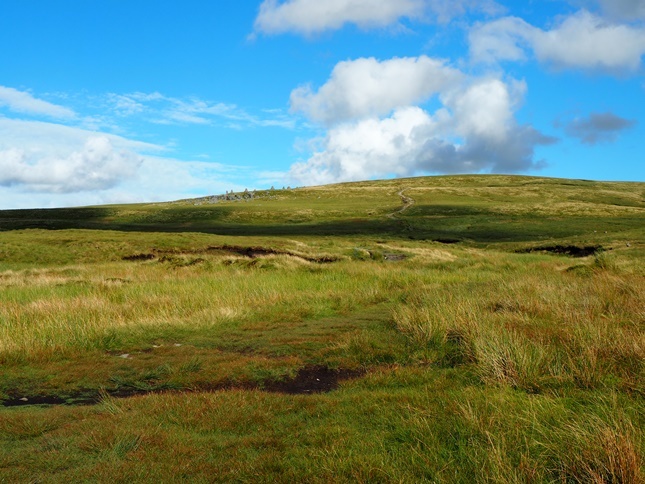 Two onward routes for Coast to Coast walkers can be used in reverse to climb Nine Standards Rigg from Birkdale to the south-east or from Whitsundale to the east. Another, even wilder approach from the east can be achieved via a largely path walk from Kettlepot Road via Brownber Edge and the disappointing Winton Force waterfall. The parking area at the end of the narrow road to Coldkeld provides an option for climbing Nine Standards Rigg from the north. Initially on a good track this leads quite close to the summit with optional detours to visit cairns on High Dolphin Seat and Bleatapow Hill. Whichever route is used the Nine Standards tend to draw most people’s attention, and quite rightly so. A short distance to the south is a topograph, which at 659m is situated a few metres lower than the highest point. 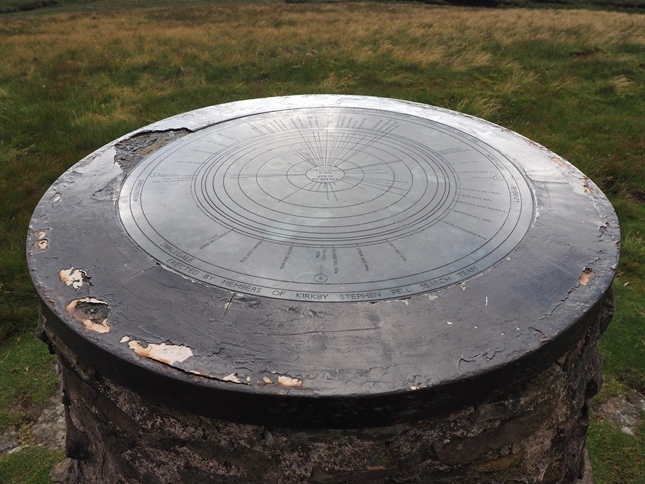 The topograph was built in 1981 by the Kirkby Stephen Mountain Rescue team to commemorate the marriage of Prince Charles to Diana Spencer. 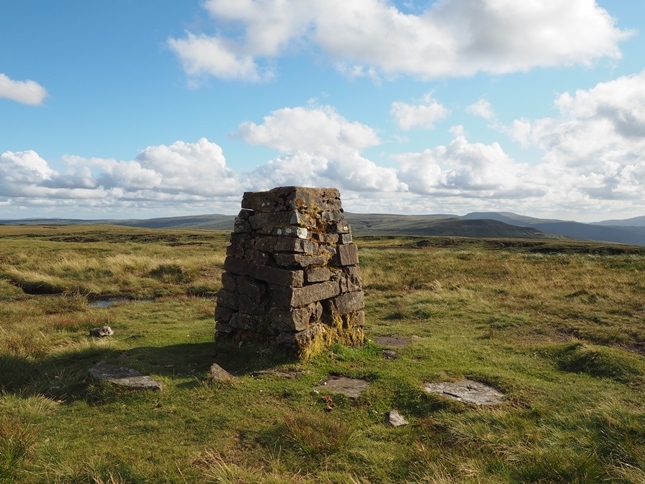 The highest point is marked by an Ordnance Survey trig point which was built in 1960. Today it is in quite a desperate state of disrepair and looks ready be blown over at any time. In all honesty the view from the topograph or the Nine Standards is better than from the trig point which has less depth to the view. Indeed it is the tremendous panorama from the Nine Standards which is the other major draw to Nine Standards Rigg. On a clear day there is a superb view of the Eden valley with Lakeland skyline to the west and the Cross Fell range of the North Pennines to the north. On a really clear day you can see as far east as industrial Teeside. 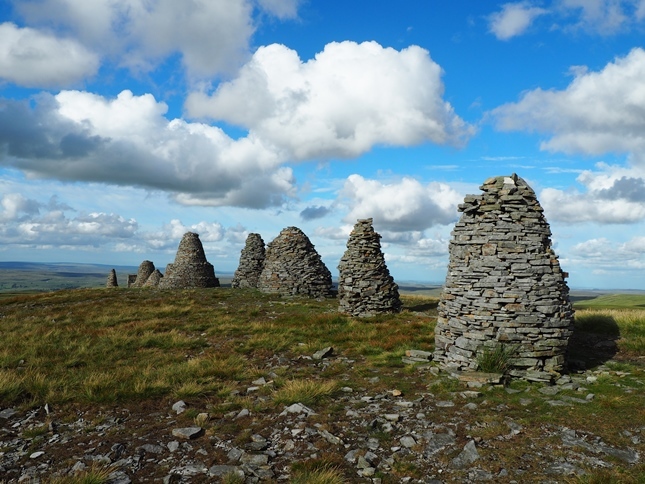 The Nine Standards are not the only cairns of note on the fell. To the south-west of the summit and overlooking Lamps Moss and neighbouring Nateby Common can be found the Jack Standards. Requiring quite a moist and boggy walk from the path to reach, the Jack Standards are a pair of cairns, one quite small, built upon a rash of gritstone boulders. Another cairn of note is the stone pillar on the near the Millstones. 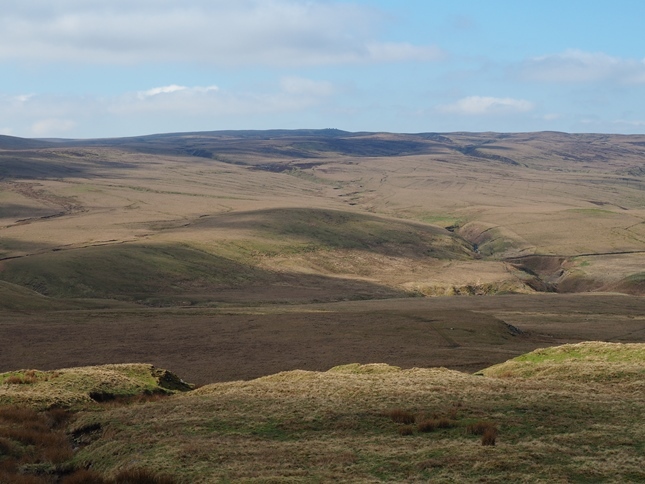 To the south of Nine Standards Rigg is a subsidary top – White Mossy Hill. Whilst the new section of slabbed paving provides some respite from the peat it can still be quite a desperate affair crossing While Mossy Hill. It certainly was on my first trip over Nine Standards Rigg when peat hags loomed out of the fog like mountains. In fact my first two visits to Nine Standards Rigg were in particularly poor conditions and it was not until my third attempt I could truly appreciate the views to be had from the fell. A fourth visit, also in good weather reinforced this good impression but also proved a reminder that when detouring from the paths that rough conditions underfoot will be encountered even in fine weather.